Every time I see Saffron Road at the trade shows, they are raving about their vegan meals. In this day and age, I think it is hard to compare to Amy's, which are, in my opinion, some of the best frozen vegan meals out there. But, I thought, why not give them a try? Saffron Road is the brand created by Adnan Durrani in an effort to produce good quality halal food with an ethical mindset. As a result, several of their products are vegan including two of their frozen meals. The Thai Basil Chili Tofu sounds boring I'll admit, but it is actually one of the best frozen meals I've ever had. I only say it sounds boring because it is your typical tofu with vegetables dish, which most vegans shy away from. But, don't make that mistake here. This meal has the perfect balance of tofu and vegetables including mushrooms, baby corn, and red peppers simmered in a savory chili, garlic, and basil sauce. The tofu has a nice firm texture. I love that they use fresh mint and fresh green chilis along with thai basil and coconut milk. The only bad thing about this dish is that although it is only 360 calories, it is 15 grams of fat. Other than that, it is perfect in every other way. 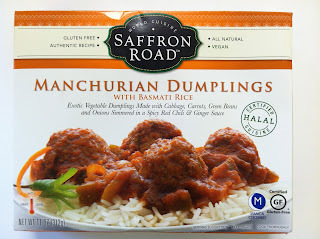 The other vegan meal is the Manchurian Dumplings. These dumplings were quite the surprise--a totally different taste than anything I've ever had. They are these delicious vegetable dumplings made with cabbage, carrots, green beans, and onions simmered in a spicy red chili and ginger sauce with mushrooms. They were soft and very flavorful. This dish also included fresh cilantro. And even though there were only 4 dumplings with rice, they were very filling. This meal had 340 calories and 11 grams of fat so it was slightly better than the other. All in all, I think these are some of the best frozen meals I've ever had. 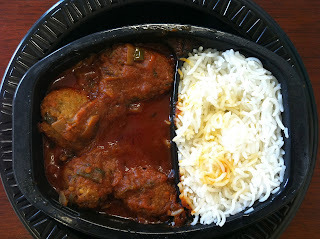 And I loved that both meals actually looked exactly like the pictures on the packages. So often I've looked at my meal, then looked at the picture on the front of the box and wondered how they were even the same dish. Not so with these! These are sold at stores nationwide. Find the closest store to you by clicking here.